Permanent magnet machines are not free from the interaction between magnets and the stator and rotor slots, which causes an undesired disturbing torque. Such cogging or detent torque is especially larger with salient pole machines, as it is the case of the Permanent Magnet Hybrid Stepper Machines (PMHSM). Depending on the application requirements, these torque perturbations can be unacceptable and the application of solutions that minimizes the cogging torque effects are mandatory. This paper originally faces the minimization of the cogging torque using resonant controllers. 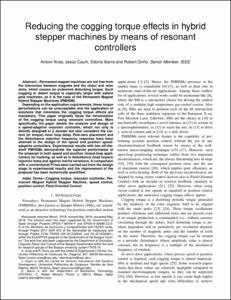 More specifically, the paper details the analysis and design of a speed-adaptive resonant controller, which not only is directly designed in Z domain but also considers the current (or torque) inner loop delay. Pole-zero placement and the disturbance rejection frequency response have been attained in the design of the speed and position speedadaptive controllers. Experimental results with two off-theshelf PMHSMs demonstrate the superior performance of the proposal in both speed and position closed-loop applications for tracking, as well as in disturbance (load impact) rejection tests and against inertia variations. A comparison with a conventional PI has been carried out from the design stage to experimental results and the improvement of the proposal has been numerically quantified.